This book left me with mixed feelings. I bought it on the basis of seeing Nick Hyam interview the author who is a multi-award-winning documentary producer working for the BBC. 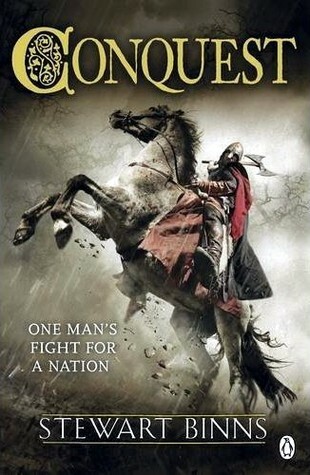 It is the first book in a series of four that starts before the Battle of Hastings (the Battle of Senlac Ridge) and goes through to the signing of the Magna Carta. On the plus side, the book reveals a lot of historical detail and gives the readers a sense of the political and military turmoil in England both before and after the famous battle. I found it illuminating to learn of the almost chance nature of the famous defeat, and of the brutality that William demonstrated both before, and in the years after the battle. The book ends just after the Siege of Ely in 1071. However, despite reading it to the end, I did struggle with it for several reasons. First, on a minor note, although it is based round a real historical character (Hereward of Bourne – known in legend as Hereward the Wake), I was never quite sure how much was fact and how much of his story was fiction. At least with Dan Brown or Scott Mariani they always tell you at the end which bits of the plot are factual and which are made up. There was no final note from the author to inform me. Secondly, the quasi-evangelical moralistic tone started to annoy me. Throughout the novel Hereward is fighting to defend England and we hear speeches and see his thoughts about this worthy purpose. And as well as the nationalism, there are also worthy thoughts about leadership. It started to have the feel of a medieval hagiography. There’s nothing wrong with that. It just didn’t appeal to me. Thirdly, the writing didn’t do it for me. The structural device is that the old warrior is describing his life to some youngsters, and perhaps, because of that, the narrative tends to be linear. As an ex-English teacher I have marked thousands of compositions that read, “And then we did this … and then we did that .., and then we did this …” I’m afraid I found parts of it boring. I wanted more conflict-tension-resolution. I also found the style to be almost romantic and lyrical. This suited a hagiography, but it didn’t create a page that drew me in and made me want to read. I won’t be buying the other three books. In his interview with Nick Hyam the author admitted that telling a story in prose rather than on TV proved to be harder than he had expected. On the basis of this book I don’t think the author has quite succeeded in overcoming the difficulties he faced. I just picked this book up in a charity shop, and am a couple of chapters in. I quite like it so far, but we’ll see how it goes. I hope you enjoy it Stevie. You might want to try the works of Conn Iggulden. A compelling write that grabs your interest and holds it. He has a series for the Mongol Empire and the Romans. I highly recommend. Thanks for the recommendation gpcox.